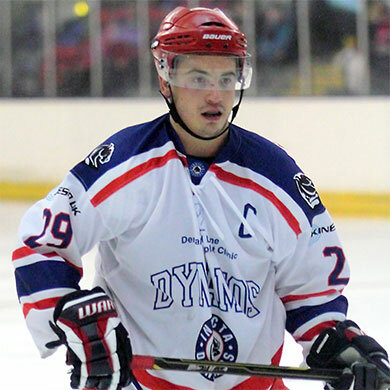 Having signed from the then EPL Chelmsford Chieftains, forward Anthony Leone first pulled on the Dynamos jersey in September 2006 but it was to become a regular occurrence from that point onwards as the skater made Gillingham his home for four consecutive seasons. In 153 appearances for the Mos he would then make his mark in the NIHL by notching 62 goals and playing a hand in 58 more for a total of 120 points – a tally that helped the side to three Southern Championships and a National Title. In 2010 Leone then made a switch to the Romford Raiders and success followed him to Rom Valley Way where he captained the team to the summit of the NIHL South Division 1 in his first term. After a further year in Essex he would then return to the Dynamos for 2012/13 where he managed 26 points in 38 fixtures – an achievement he would surpass last season where 23 goals and 26 assists saw him amass 49 points. Now the physical forward will be hoping to add to his total tally of 199 points in Mos colours as he continues to ice in Gillingham throughout 2014/15 where he will lead the team donning the ‘C’ for a second campaign. “There’s no-one out on that ice who wants to win as much as Anthony and that’s exactly the drive you want from your captain. His leadership is invaluable to the team both on the ice and from the bench and all the guys respect the passion he has built for the Dynamos in his six seasons with us in Gillingham. On top of this he has the ability to get amongst the points and last term was amongst his best at the club so I have no doubt he’ll be out for similar again this year. Anthony is one of those players you’d much sooner have fighting for you than battling against you and I am very pleased he will be wearing a Dynamos jersey again in 2014/15”.